Unless you’re the sort of person who scours the daily specials at high-end sushi bars, you might not have a deep familiarity with the surf clam. About the size of a salad plate, the mollusk is usually caught in the chilly waters of the North Atlantic and is known for yielding a flat curl of meat that blushes pinkish-red when steamed. When prepared properly, it’s a delicacy: tender as a scallop and sweet as lobster, with a mellow oceany flavor that builds as you chew. At her Monterey Park seafood restaurant, Hip Hot, Tiantian Qiu is mostly known for fiery Sichuan-style cooking that involves heaps of dried chiles and mouth-numbing peppercorns, but with the surf clam she takes a different approach. Poached in buttery chicken stock that’s spiked with a dose of wasabi, the fin-shaped bits of shellfish arrive fanned out like cards over a bed of blanched Chinese broccoli. Delicate and soothing, the dish exists in another universe from the heat-blasted hot pots that Sichuan food usually brings to mind. But don’t stop there. 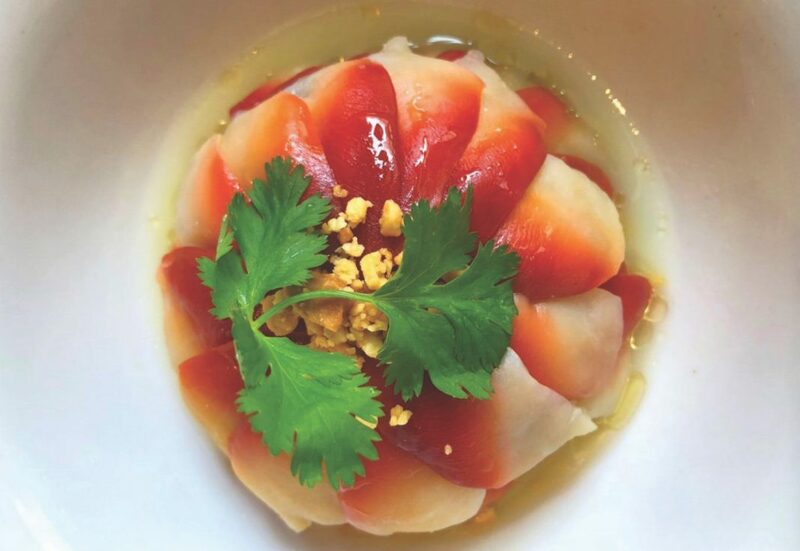 Qiu’s other creative seafood creations—clam-topped egg custard or a scallop with foie gras sauce (wash it down with sweet watermelon juice)—will have you making return trips, too. Hip Hot, 500 N. Atlantic Blvd., #149, Monterey Park.